The second week went even more smoothly than the first. Naomi was slightly cranky on Monday, but in general very happy during the week. She is lots of fun to take care of, and we have some entertaining photos and video to show for it. On Saturday we finished where we left off walking on the Freedom Trail, taking a tour of the USS Constitution ("Old Ironsides") at the end of it (we skipped Bunker Hill, whose monument we could see in the distance and dismiss as a Washington monument knock-off). We also got to walk through the St. Anthony's feast festivities. We had some greasy, hot-on-the-outside, cold-in-the-middle calzones. There were nice decorations on the streets, though. And we had some free ice cream. We walked along Newbury and went to some record stores and gift shops. The record stores kind of made me ill, because I am overwhelmed by musical choices. We bought some smooth'n'melties from a place called Sugar Heaven. There was a clothing store set up like a bakery called Johnny Cupcakes - a store all about image. Sunday we went to a rainy Cambridge for a Caribbean carnival celebration. It was neat to see a lot of dancers and hear some great music (recorded as well as live), but the dampness put a damper on things. We got to meet two of Phil and Teresa's friends and had some Thai food (the Jamaican food line was three times as long as any other). Today we visited Haley House, which has served the poor of South Boston with food and social justice programs since the '60s. Shannon found it as a possible place to live/volunteer, if we end up staying in Boston. We got a little tour of the very vertical building and a bit of an idea of what the place is like. We have realized that Boston is in fact a small town. It takes very little time to get from one point to another. I don't think it would have occurred to us if we hadn't been living here for a few weeks. This weekend we are going to New York. We will either stay at my other brother (Ted)'s place, although he will be out of town, or with friends of mine. I am kind of nervous because I have never been there. I am afraid of being intimidated from awe or of being disappointed. On Thursday Teresa took us to an infant CPR class, which was good and helpful. The methods for CPR were just recently changed, we learned. On Friday Phil and Teresa hosted a cookout for all the tenants of the building, including a woman downstairs that they know from Wisconsin somehow, a Swiss couple upstairs, and the kindly elderly landlord. It was a good time. I provided the soundtrack, playing my iPod on tinny, nearly inaudible speakers. On Saturday my friend Jason, who graduated with me in Print Media at Crabrook, came down from Salem with his girlfriend Emily to drive us around. Once again, Shannon provides the best description of events. It was a blast seeing him again, and I felt like I was observing him a little more in his element. His lenticular public art piece on the silver line is awesome. On Sunday we went downtown on our own and walked part of the freedom trail. We also ate at Cheers (aka Bull & Finch) and walked around Boston Common. A very good day. I walk on my shoes sideways, maybe because of the shoes, which are falling apart, or maybe because I just walk that way, although I didn't always. At any rate, I think I need new shoes. Today Phil and Teresa made jambalaya, which we all had for dinner. Yum! In two weeks we're going to see Cat Power at the MFA. Yes! I have an illustration gig. It won't pay much and I don't know if I'm allowed to announce who it's for yet, but I'm excited about doing it. I made my first illustration today and am pretty pleased with it. It will probably show up on Flickr soon. The first day of watching Naomi went pretty well. A lot of time was spent trying to calm her down, and she didn't sleep or eat as much as she usually does (we learned later). Naomi liked the two walks we took her on. Overall it was a good day. Today was better, she ate a lot and slept for long periods, and was really happy when we were playing with her. I think she's getting used to us. Shannon has a picture of me entertaining the wee one. On our trip to the grocery store today we had one adoring elderly onlooker who asked us Naomi's age. 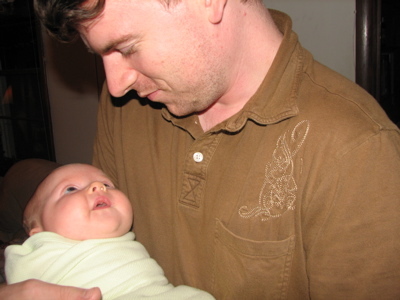 People are generally considerate of you if you have a baby strapped to your chest. She's like a negativity shield! Last night we played this tile-based board game called Carcassonne with Phil and it was a lot of fun. Shannon and I played it by ourselves again today. I found a couple of interesting jobs in my search today, although not necessarily in Boston. I had a dream last night that I went to see Tony Hepburn and he disapproved of all of my artwork. It was horrible. We have arrived in Boston. But about the weekend: the Comet Center where Shannon is director opened on Friday with much success and community support. Pictures are here. On Saturday we helped make mints at Shannon's aunt Amy's house for Dustin & Katie's upcoming wedding, then came back for dinner later that night. On Sunday Shannon organized and ran the wedding shower for Katie, with a pharmacy/drug theme. I was not in attendance but I heard that a good time was had. Then we went to Delhi with Shannon's mom and sister to hang out with relatives at a cabin there. This morning we were dropped off at the Dubuque airport. The weather is pleasantly warm here (cool now, in the evening). We've just been sitting around talking, cooing over Naomi, and we went for a nice walk before making dinner (barbecue chicken + green beans + corn = familiar goodness). We like it here and are totally stoked to get to hang out with Phil, Teresa, and Naomi for almost a month. Tomorrow is the start of our most important reason for being here: taking care of Naomi while Phil and Teresa are at work. Went home last weekend for the first time in about a year. The occasions were my Mom and Dad's birthdays (September 9 and October 30, respectively) as well as my niece Naomi's baptism. 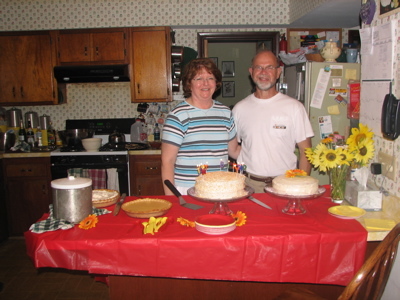 The birthday party was great. Tons of people showed up, family and neighbors and local friends. Shannon and I made the decorations, Ted and Lorri organized the thing overall and made all the food (which was delicious - I must get recipes). It was good to see everybody, especially my family, whom I hadn't seen since Christmas. We got to hang out with Kate a little more, since she stayed with us one night at Mary's house (because Mom & Dad's was a little crowded). Mary has an awesome heated pool, so we lazed around there with Mary and Jean (my godmother). Kate played us a cd of catchy songs she made in Garage Band; she asked me to do a remix of one of them, so I will. So we finally got to meet Naomi! She is amazing. Shannon learned how to swaddle Naomi and turn her into a glowworm. It makes her (Naomi) surprisingly content. Phil was excited to show us all kinds of "tricks" he's figured out or read about to comfort the baby. One attempted technique that didn't stop her crying prompted my uncle Henry (or maybe it was Papa) to say "better try another one!" I chose the photo more flattering to Naomi than to me, although it's hard to take a bad picture of her. 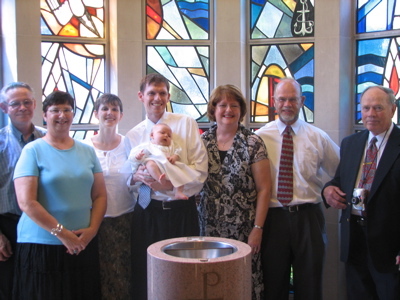 The baptism was nice, taking place in the church's beautiful baptistry. Naomi + parents + grandparents + great-grandfather. This post is kind of jumbled, I apologize. I have either too few details or too many.